Australia’s fintech industry had a strong finish to 2017 in a year that saw growth and change that our members can be bullish about. We now make up about one fifth of the Australian startup industry (according to the latest Startup Muster report) and have among the best fintech market penetration in the world according to EY. Our success was illustrated by our EY FinTech Australia Census, which showed the huge growth and maturity of the Australian fintech industry – something we can all be proud of. The Census found that monthly revenue by Australian fintech companies increased by 208% (or 3.1 times) from June 2016 to June 2017, with about a quarter of fintechs reporting an incredible 700% increase in revenue. We came together to celebrate this at our inaugural Intersekt Festival, held in Melbourne in November where our community took to the stage to discuss our rapidly-changing industry in front of some 1,500 participants, including 822 delegates to the marquee Collab/Collide Summit. The Australian Treasurer Scott Morrison came to our festival with a goody bag of fintech-friendly announcements and news, chief amongst them a decision to mandate positive credit reporting. He also noted the passage of long-fought for retail equity crowdfunding legislation for public companies. Having a record ten companies in the highly-regarded Fintech100 report, putting it second only to the United States and ahead of other key markets such as Singapore and the UK. 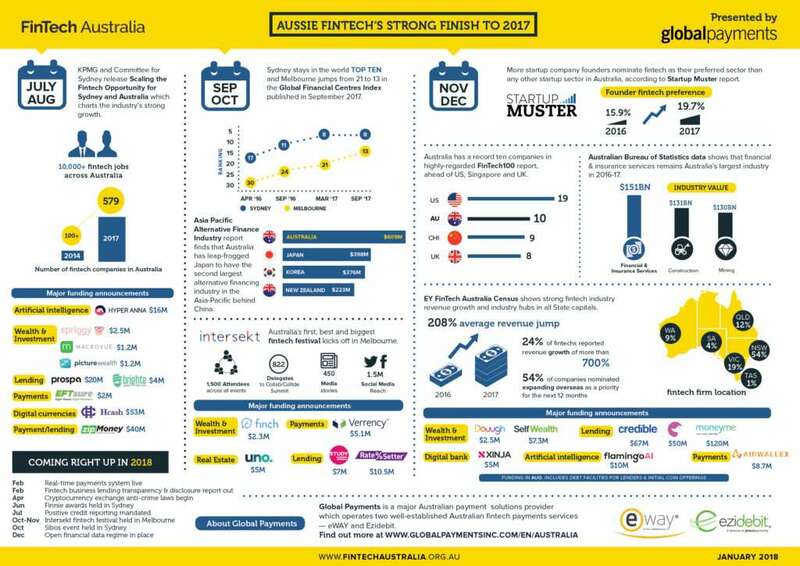 In celebration of our achievements over the past six months we have prepared an infographic which has been kindly sponsored by Global Payments, a major Australian payment solutions provider and engaged member of our fintech community. Just before the year ended, the Victorian Government also gave us an early Christmas present by announcing that it was backing not just one, but two, fintech hubs in Melbourne. As the founder and CEO of Melbourne-based fintech marketplace lender MoneyPlace, it is exciting to see how Victoria – through its Innovation Minister Philip Dalidakis – is swinging behind the fintech industry, both through backing these hubs and as the presenting partner of Intersekt. Also over the Christmas-New Year period, fintech hub Stone & Chalk moved into an expanded home in the NSW Government’s 11-level Sydney Startup Hub – the largest of its type in the southern hemisphere. It has given us a remarkable launching pad for 2018. We expect both incredible opportunities and collective challenges with the three big issues to be data, payments and competition. The Australian Government’s commitment to create a financial data framework by the end of this year is expected to be transformational in unlocking the full power of customer data. It will mean an empowerment of customers who will be able to seamlessly move banks, get instant access to interest rates tailored to their personal circumstances or easily see a single view of their entire wealth across multiple providers. As our submission to the Australian Government’s open data review outlined, we believe Australia’s open data framework should be the best in the world – extending not just to banking account data but also to superannuation, investments and insurance. The $1 billion New Payments Platform (NPP) – to go live in February – is set to put Australia’s payments system on the world map, by supporting a payments system which is faster and easier to use and understand. Come mid-February, you will no longer have to wait up three days for your payment to be processed – it will instead happen in a matter of seconds – and what’s more you will be able to pay someone simply by knowing their mobile phone number. We will be watching the NPP closely to ensure that the NPP benefits the entire fintech and financial services community – not just its initial participants. The underlying and evolving issue for 2018 involves competition. The Productivity Commission is producing a report on competition in Australia’s financial system, with a view to improving consumer outcomes and providing economic and productivity benefits. The draft report is due out in February. Meanwhile, the Australian Competition and Consumer Commission has been given $13 million in additional funding over four years to undertake regular inquiries into competition issues across the financial system. These high-level competition inquiries will be happening alongside the Royal Commission into the Banking, Superannuation and Financial Services Industry. While the Royal Commission is primarily focussed on misconduct issues, we expect it to illustrate the need for improved competition and consumer choice to place downward pressure on misconduct. Importantly, our Census also showed that many fintech firms want to collaborate with banks, but struggle to do so. We believe that a policy environment more supportive for competition is also one that is likely to lead to improved collaboration. This is something we will be fighting for in 2018, supporting the Australian Government’s efforts to boost competition and developing a detailed policy platform to take the fintech competition agenda to the next level. Finally, FinTech Australia will again be working hard in 2018 to promote the best and brightest in our industry. With the support of the NSW Government’s Jobs for NSW, we’ll shortly be launching our 2018 Finnies awards – Australia’s only industry backed fintech awards. And given the success of Intersekt 2017, including its Collab/Collide Summit, we will again be in Melbourne in October this year running Australia’s only national fintech festival. Finally, a huge thank you on behalf of our industry for the work done by outgoing chairman Simon Cant. Simon has been pivotal in helping guide FinTech Australia from being little more than an idea to the strong organisation that it is today. Importantly, he will be remaining on the board to continue to contribute to our community’s growth. I am excited to be taking the reins as acting chair at FinTech Australia and look forward to continuing the important work of this organisation to improve our industry and help our members to grow. 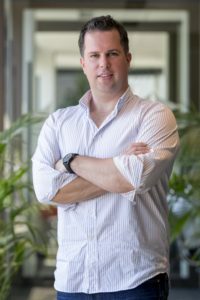 Stuart Stoyan became the chair of FinTech Australia in January 2018. Prior to this he was Deputy Chair and was also a member of the inaugural FinTech Australia Board. Stuart is the founder and CEO of marketplace lender MoneyPlace.